Just breaking...Kushner implicated in Flynns testimony today. How do you think they got the charge? From a grand jury. Also take note of the dates of the incident. See how your doc above says "Count One"
* A prosecutor does not need a Grand Jury to file a charge and more to the point, wont use a Grand Jury to throw the book at someone if they agree in advance to cooperate. In that scenario, they file a lessor charge and a guilty plea is entered just as everyone agreed too in the cooperation greement. If he was going to flip and roll then he would've been given immunity! You don't destroy your start witness' credibility by allowing him to admit to LYING! Flynn made a public statement this AM saying he agreed to be a cooperating witness with the Special Counsel's Investigation. I'm not sure how many times you have to be told that conspiracy requires an overt action. Pitching a bad/criminal idea is not a crime. Even agreeing to do it is not a crime. Also worth noting what Flynn is giving them for this sweetheart deal. Four members of the Trump Campaign have been indicted or charged. One was the Chairman of Trump's Campaign and another was his Chief National Security Advisor. Two are cooperating witnesses to bring down bigger fish. Keep telling yourself nothing to worry about. I'm not worried. I'm not Donald Trump or any member of his administration. But facts are facts, and increasingly the facts suggest there is no evidence of collusion. 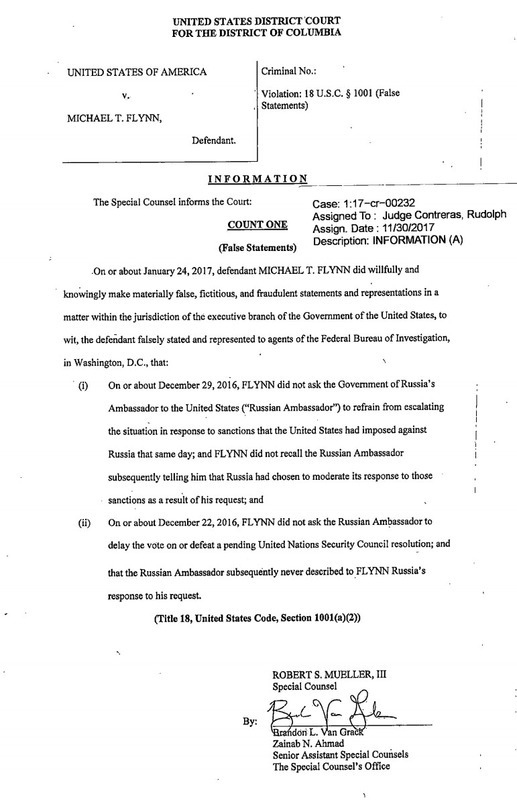 Flynn's agreement is concerning contact after the election, on matters unrelated to the Trump/Russia narrative. There has been nothing to indicate he even knows anything that relates to The Narrative. Pappadopolus was a little fish, who by his own admission contacted the Russians on his own initiative. It seems like his suggestion was ignored anyway. Manfort and Gates are fighting their charges, which again are unrelated The Narrative, and have filed motions to have the evidence thrown out. There's a decent chance they might succeed, because what's been leaked to the public suggests that the raid that seized the records likely exceeded the scope of the warrant. Mueller hasn't yet charged anyone for anything related to interfering with the election. If there was anything to find, you'd think he'd have more to show by now. I told you guys that like five pages back. Get with the program.